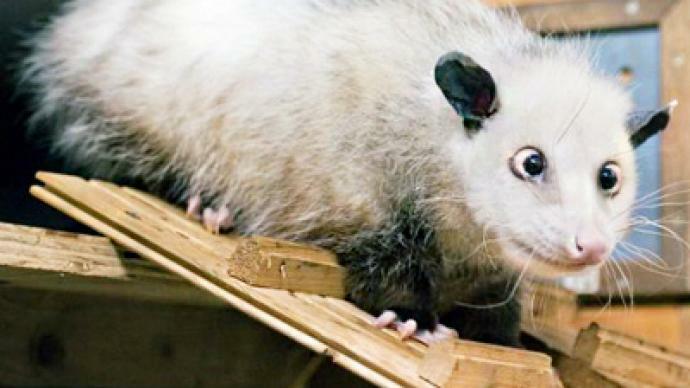 A two-year-old opossum in Germany has become a worldwide internet sensation, with more than 110,000 fans on Facebook. The gray-haired, cross-eyed Heidi is still waiting to make her debut at Leipzig zoo, where she arrived from a Danish zoo last May, along with her sister, Naira, and a male opossum. Heidi has become so popular after a German tabloid published pictures of animals which are moving to the zoo’s new facility. After the photos of Heidi were released, she was put on television, received her own Facebook page, and even got a song, which was specially written for her, and a video on YouTube. Zoo employees say the opossum has become popular not only because of her funny appearance, but also due to fate. Allegedly, Heidi was left by owners in the US, who treated her badly. Heidi's crossed eyes might be the result of a poor diet when she was young, experts surmise. Poor vision is not a problem for Heidi. As nocturnal animals, opossums rely heavily on their sense of smell instead of their sight to get around. Heidi is the latest in a line of much-loved creatures to be given celebrity status by the German media, after Knut the orphaned polar bear and Paul the psychic octopus.